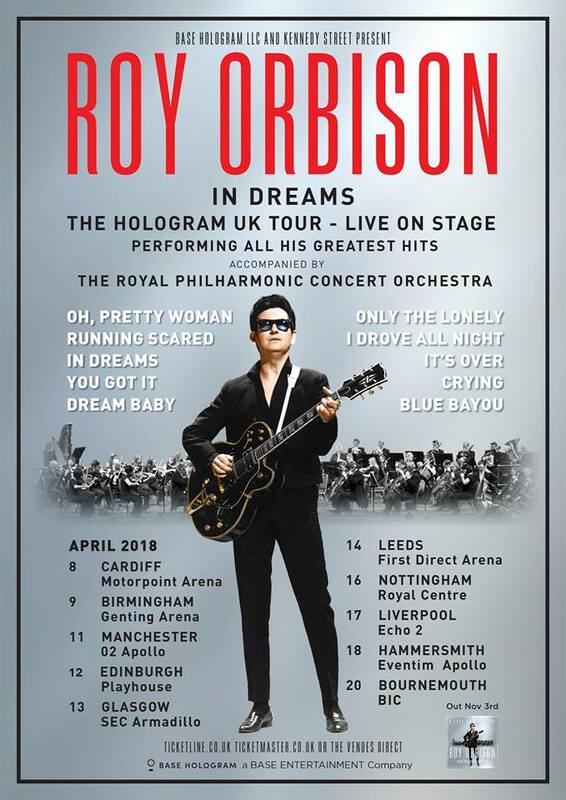 Timed perfectly to compliment the much anticipated forthcoming new orchestrated Roy Orbison album "A Love So Beautiful: Roy Orbison with The Royal Philharmonic Orchestra" (released in the UK on Friday 3rd November), tickets go on sale next week for "Roy Orbison In Dreams: The Hologram UK Tour" which will see a holographic Roy performing his biggest hits across the UK next April at ten venues backed by The Royal Philharmonic Orchestra. Fans and followers of The Big O are promised a "transformative live entertainment concert experience". elobeatlesforever (elobf) recommends "A Love So Beautiful" by Roy Orbison with The Royal Philharmonic Orchestra and "Roy Orbison In Dreams: The Hologram UK Tour" to those enlightened folks who enjoy the music of ELO, Jeff Lynne, The Traveling Wilburys, Roy Wood, The Move, The Idle Race, 'Brum Beat', The Beatles and related artistes. See you there?